Each fall, millions of people in Europe, North America and Northeastern Asia choose one weekend to enjoy the only moment of the year when frigid Northern latitudes gain colors as bright as those of our tropical ancestral lands. Just as hot coffee, bathing tubes, beach resorts and other "gifts of civilization", it is probably a subconscious attempt to return into the warm and bright-colored world of our East African motherland, our Paradise Lost. 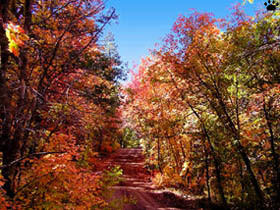 This annual gift of dark-blue sky, carpets of dry leaves on the forest floor (so much like in dry forests of Ethiopia! ), and spots of sunlight passing through the golden canopy, is a brief moment of happiness before the long, freezing winter that we have to endure because of our past migration into the lands we were not made to live in. 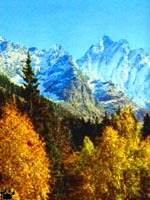 This page is a brief overlook of some of the world's best places to see fall colors. 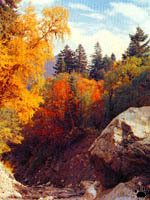 Fall colors, Tajique Canyon, New Mexico. 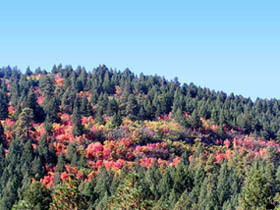 Fall colors, Manzanos Mts., New Mexico. September in Central China. The most interesting and diverse colors can be seen in the so-called refugia of Tertiary flora. 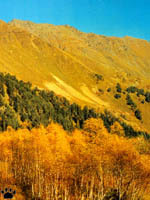 There are three main regions where deciduous forests of warm Tertiary Period have escaped the Glacial Age: Eastern Asia, Eastern USA, and the Western Caucasus. Southern Ussuriland. 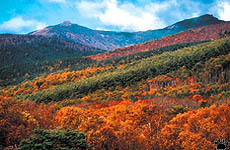 Of these three, East Asia (particularly China) has more tree species than any other non-tropical part of the World. Unfortunately, September is often rainy in Chinese mountains. It is more dry in Japan, but here the nights are not always cold enough. 6-A. cissifolium, 7-A. ginale, 8-A. platanoides. 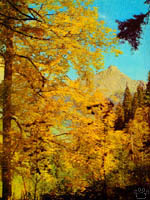 4-Quercus mongolica , 5-Ginkgo biloba. Greater Hehtzir Mountains, Northern Ussuriland. 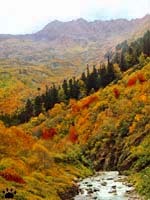 Early October, Ussuriland Only in North-Eastern China, North Korea and Southern Ussuriland, can you expect the optimal weather conditions for spectacular fall colors: September is mostly dry and sunny, but night temperatures are just below freezing. 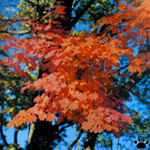 Maples, elms, ashes, lindens, walnuts, mountain-ashes and burning bush (Euonymus) are the most beautiful of local trees. Ussuri Nature Reserve north from Vladivostok and Pyaktusan Volcano on China/Korea border are among the best locations, with prime time in late September and October. Kentucky, USA. 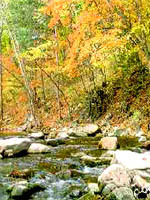 In North America, the most interesting place to see diverse fall colors is in wonderful hardwood forests of Great Smoky Mountains National Park, and Appalachian Mountains in general. 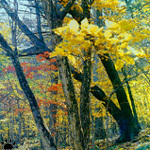 Maples, oaks, sumacs (Rhus), and yellow-poplar (Liriodendron tulipifera) are most colorful. The best time is usually mid- to late-October. 6-A. barbatum, 7-A. leucoderme, 8-A. platanoides. 6-Prunus pennsylvanica, 7-Quercus vetulina, 8-Q. laevus. Birches, Ritza Lake, Abkhazia Forests of Western Caucasus do not have as many tree species as China or USA, but autumn weather is absolutely perfect, and fall colors are outstanding. 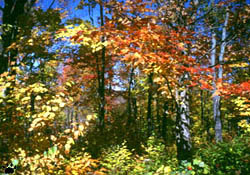 In early October, beech forests of mid-elevations are golden-brown, oak-chestnut forests of higher elevations are bright yellow, and the timberline is lined with red maple Acer latifolia and golden birch Betula caucasica. 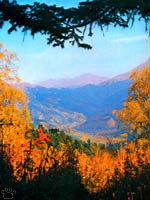 The vicinity of Kavkazski Zapovednik (Nature reserve) on Russian/Abkhazian border, particularly areas above Kardyvach and Ritza lakes, is the most beautiful part of Western Caucasus. Staghorn sumac(Rhus typhina) forest, Indiana.